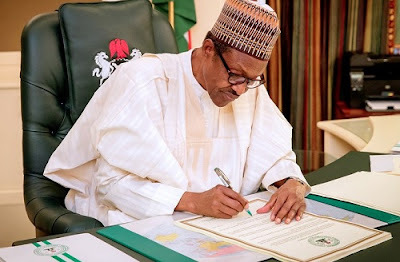 President Muhammadu Buhari has just taken to his verified Twitter account to announce that he has finally signed the 2018 National Budget, just a few minutes after midday on Wednesday in his office at the Presidential Villa, Abuja. About seventy (70) new road projects have been inserted into the budget of the Federal Ministry of Power, Works and Housing @FMPWH. In doing so, @nassnigeria applied some of the additional funds expected from the upward review of the oil price benchmark to the Ministry’s vote."